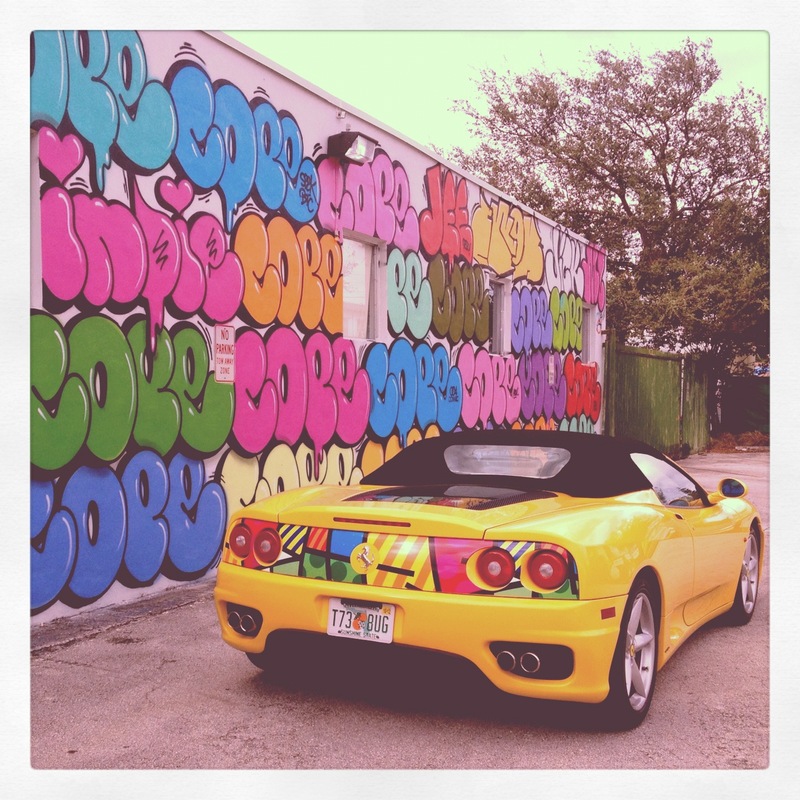 Art Basel with KD in Miami: Day Seis! My trip to Miami was fastly coming to an end as I savored up day 6 to its fullest potential. I only had one more day to soak up that Miami sun, meet and greet a bunch of Kweenz Destroy fans and my readers at the gallery, visit galleries I still hadn’t seen, watch street artists work their magic on Wynwood walls, and see whatever else Miami had to offer. It was another perfect day, I can’t complain except for the fact that there was a power outage at a Goldrush party we were supposed to attend but we made the best of our night as Wynwood was still up and running down to the very last second of Art Basel. 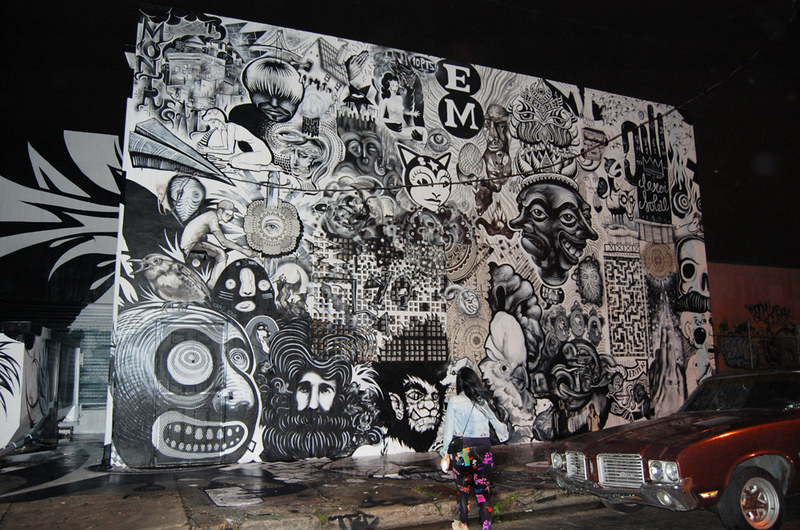 On this day many artists were finishing their walls and we caught a great glimpse of it all. 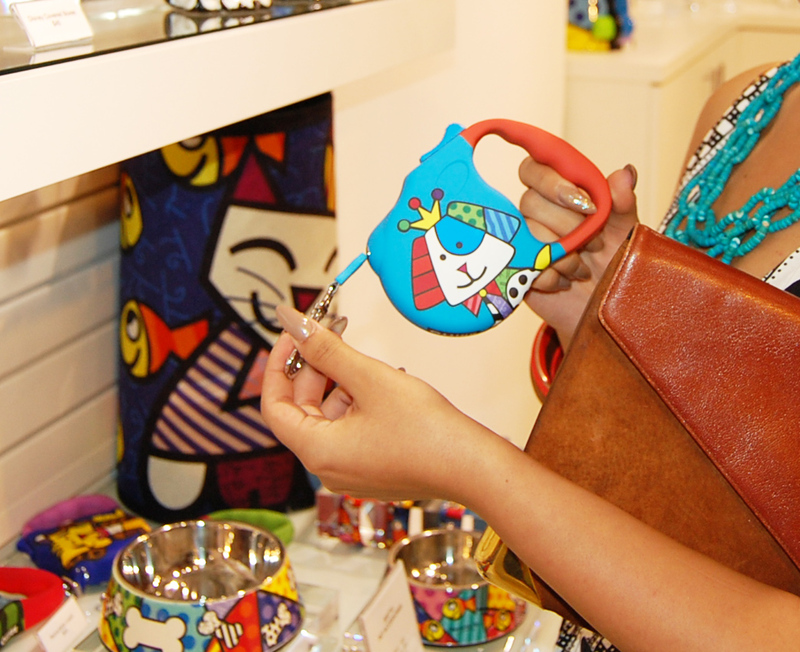 It is always refreshing and inspiring to see artists at work, doing what they love for the world to see. I am sure many of you who love to be visually stimulated as I do will love this post. See more photos and details inside. 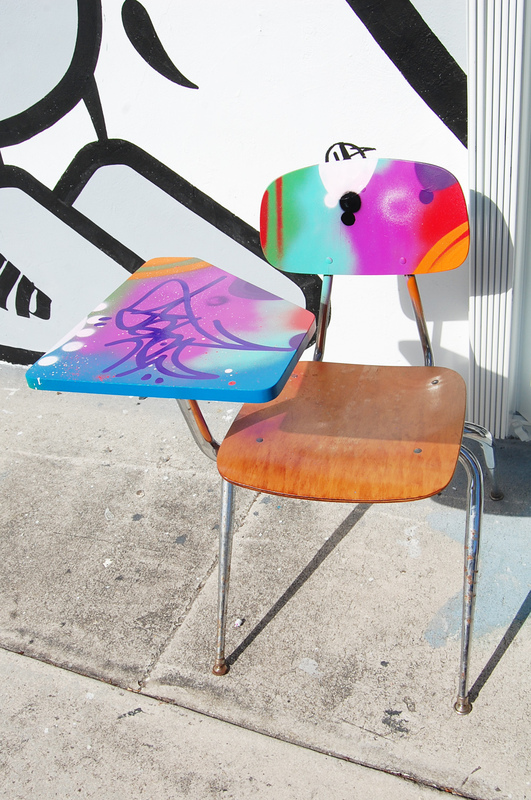 A member of the Lombardi staff asked Cope2 to create a special piece on his son’s school desk. 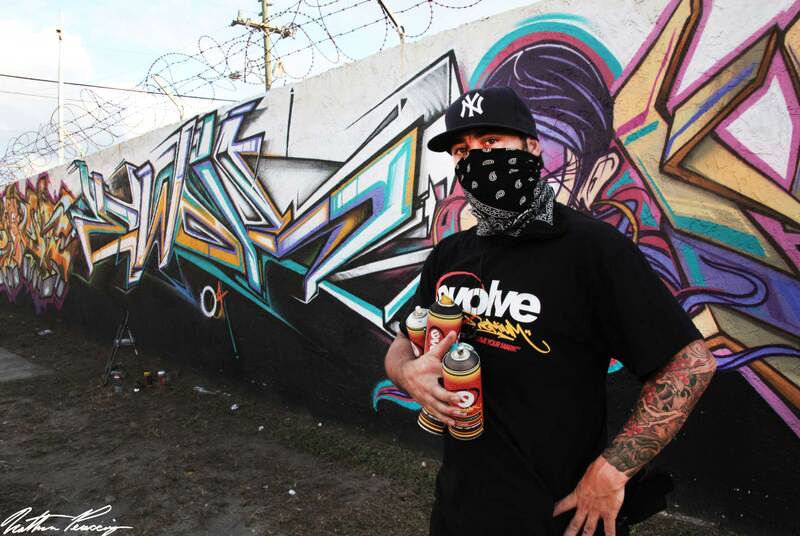 It was an incredibly sweet gesture on Cope2‘s behalf. 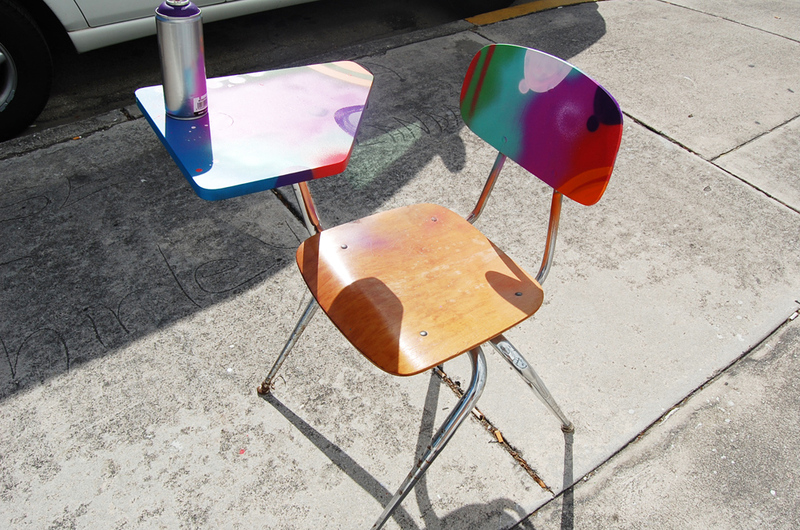 If I was a kid, I’d be stoked about this desk! Cope2 did a wonderful job and I am sure that little boy is going to love it. I finally caught this man in action. 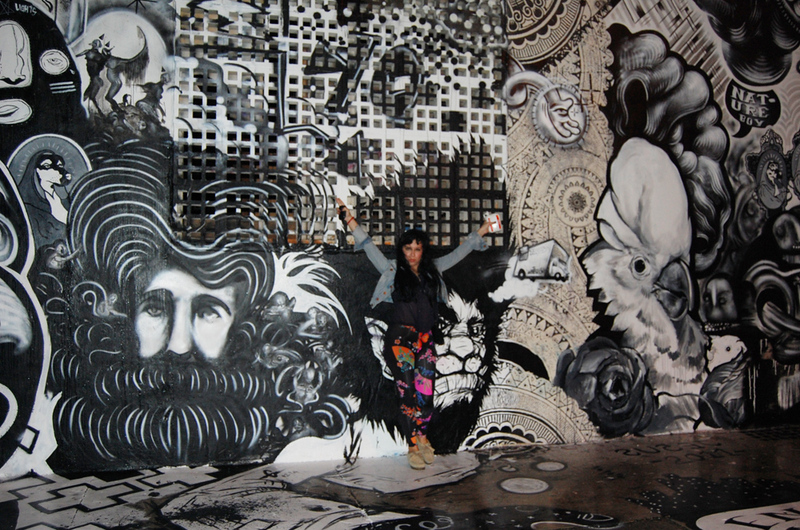 I was at the Underbelly Project and saw some of his work and became enamored by it instantly. So beautiful. 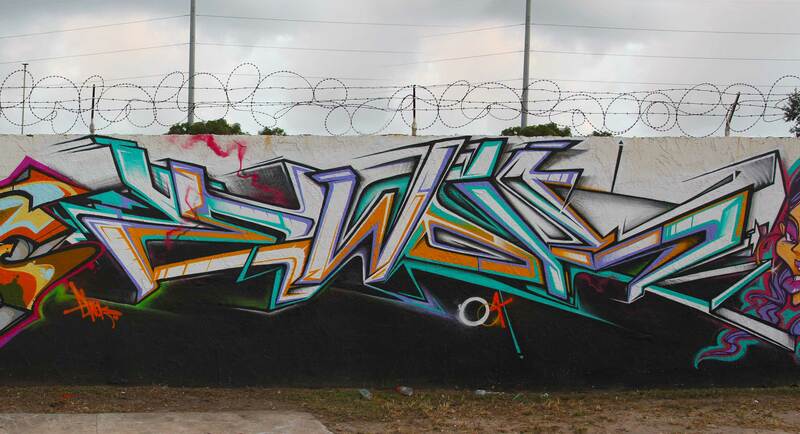 This is Ewok 5MH finishing his wall amongst other graffiti writers. 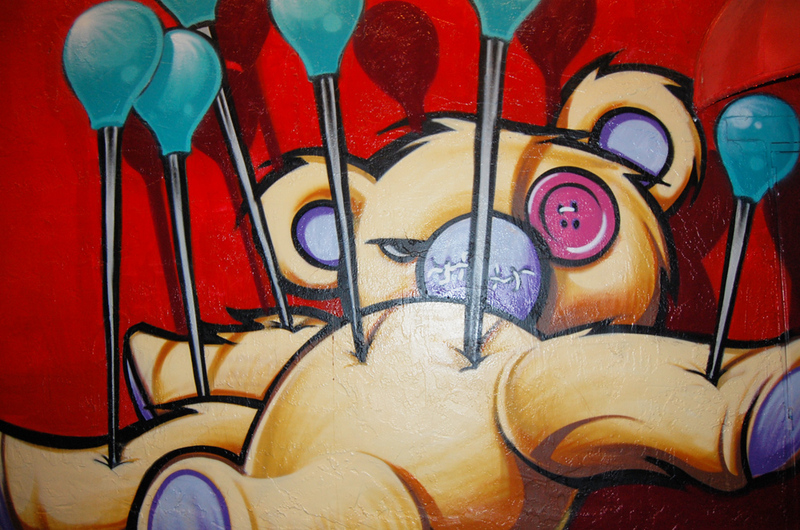 Ewok has a wonderful imagination and creates these fun/eerie/radiant pieces and characters with the snap of a finger. It is a tough skill to pull characters out of a hat and to adapt to any setting, and he does just that..effortlessly. Not to mention, he has a great personality to match his fun artwork. His finished wall. photography and video from Nathan Peracciny via (http://mr-ewokone.com) Awesomeness. Jolt aside Ewok 5MH. Awesome work. Finished wall. 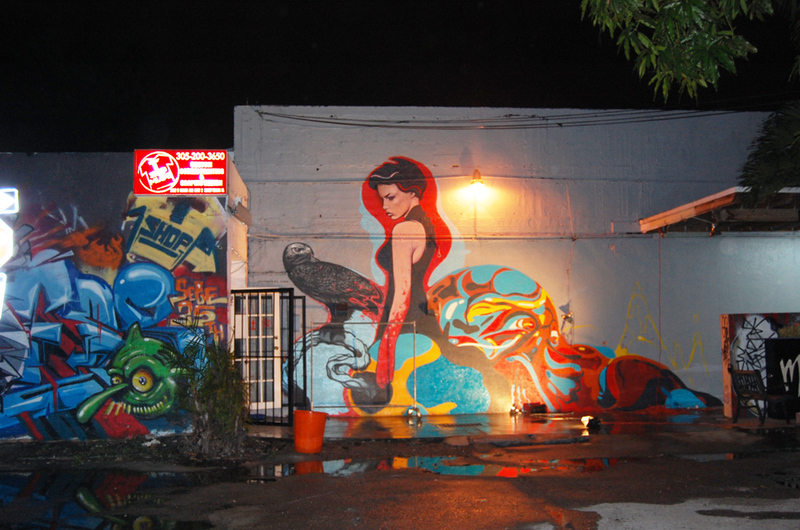 Pic via (http://mr-ewokone.com) While I was running around taking pics of everyone’s work I spotted Cope2 painting walls as well. I love his colorful bubble letters! 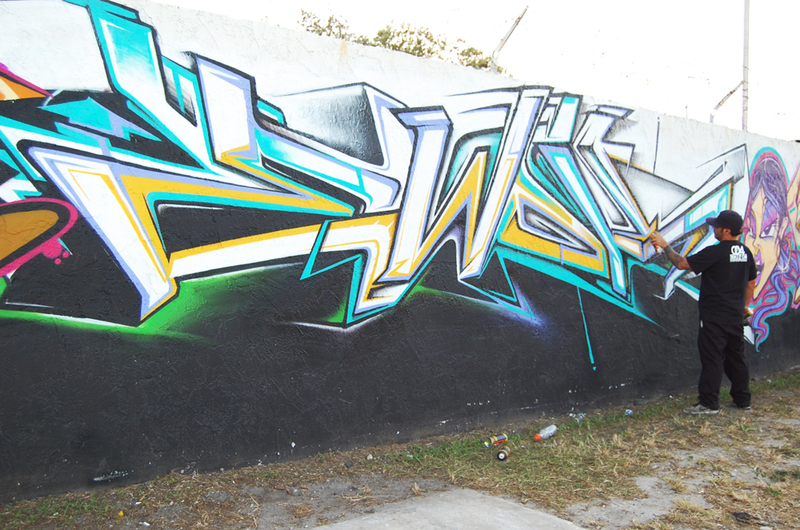 This is another wall Cope2 worked on before I got there. I love it, look at my girl Indie184! Fountain is probably the only event we didn’t attend. 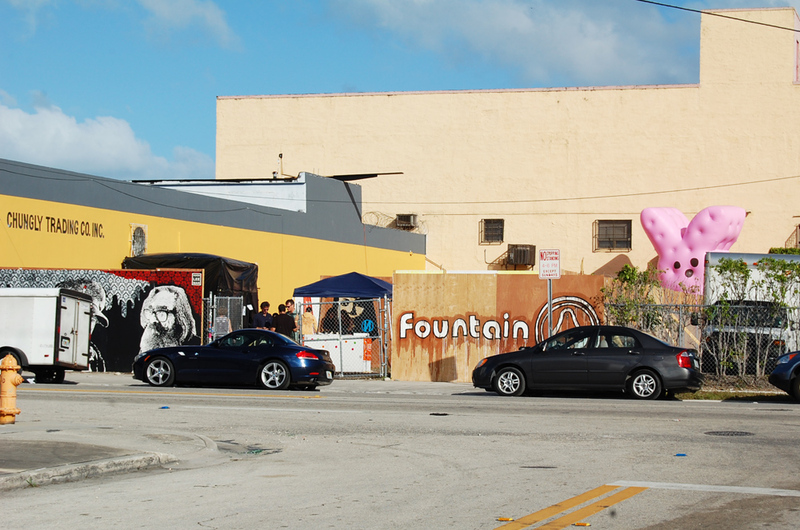 Kinda regretting it now that I see a giant pink bunny lol. 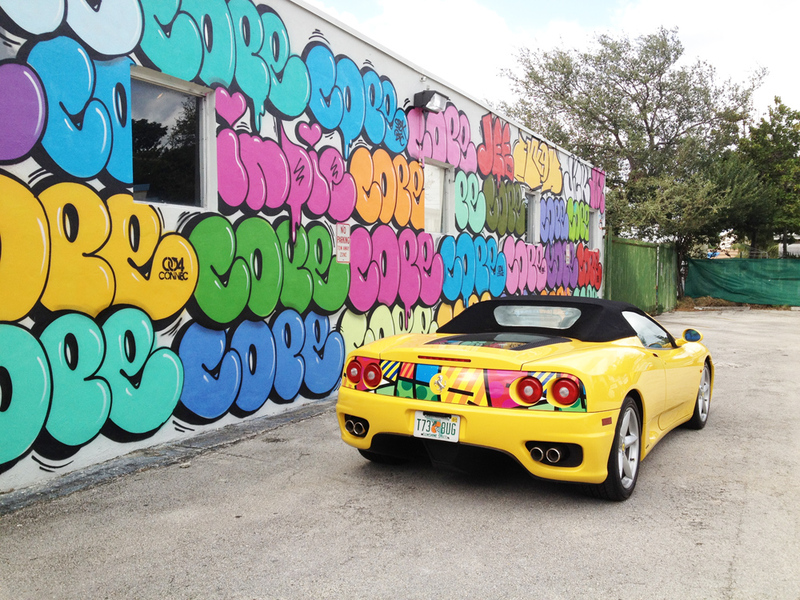 Back at the Cope2 gallery, Britto had his whip parked at the parking lot. 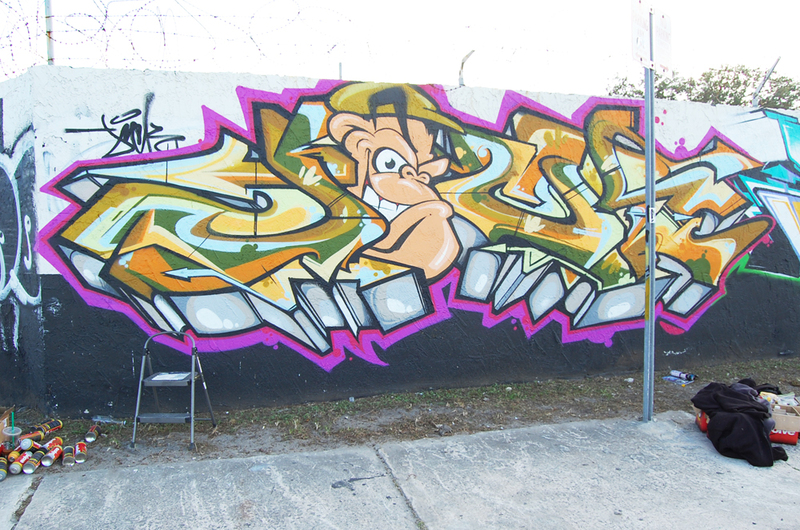 It looked amazing aside the wall Cope2, Indie184, Ewok 5MH, and JEE painted. 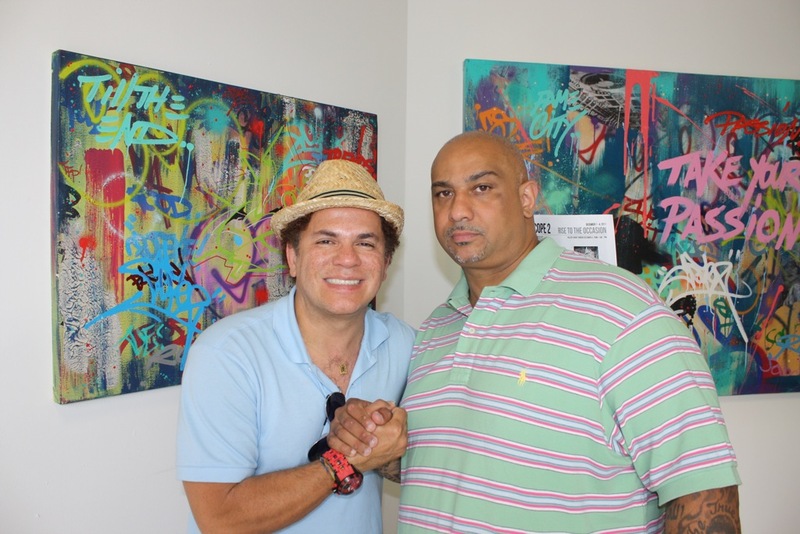 YESSSSSSS Romero Britto even came to the Cope2 Gallery to see Cope‘s work! See more here. 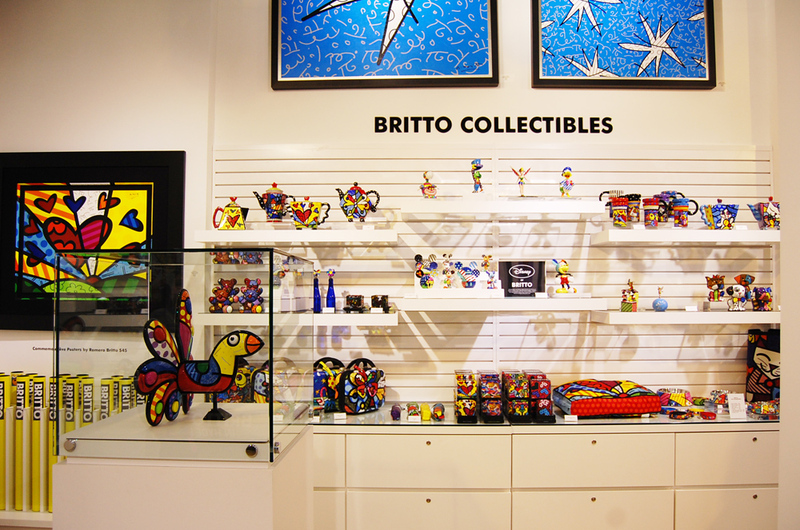 Speaking of….Across the street from us was a cute Romero Britto pop-up shop. Of course we had to go see it and take pics! I wanted everything. lol. 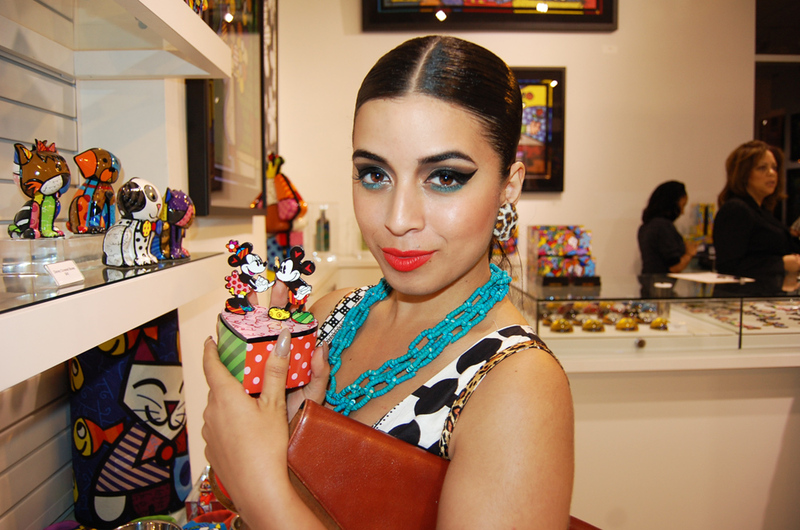 I loved this cute little Mickey and Minnie mouse Britto box. Too cute. I wanted all of his makeup cases too! Smart man. This cute leash made me think of my baby back at home. My little rexy. My girl Ini came by at just the right time everyday, just in time for the festivities! She looked sassy in her Versace for H&M leggings! ❤ Bewbs! Cutie-pie! 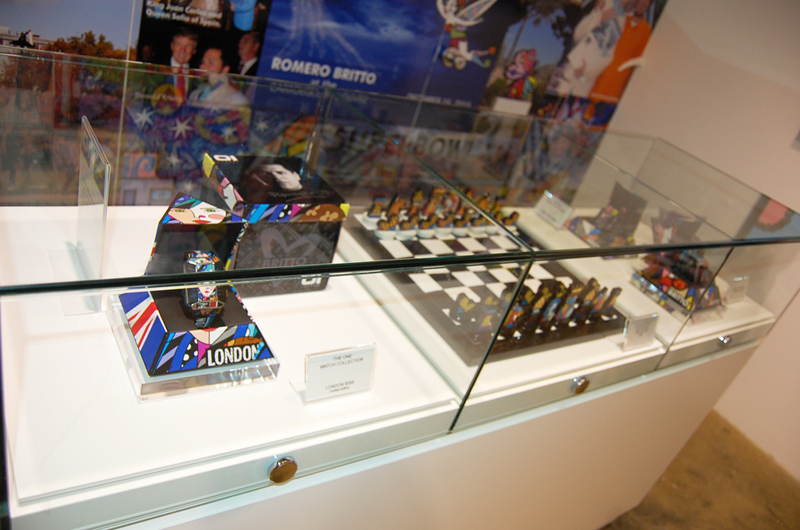 Loved the chess set! lol. My dress was totally fitting for this pop-up shop. If you are wondering, my dress is by Boxing Kitten. 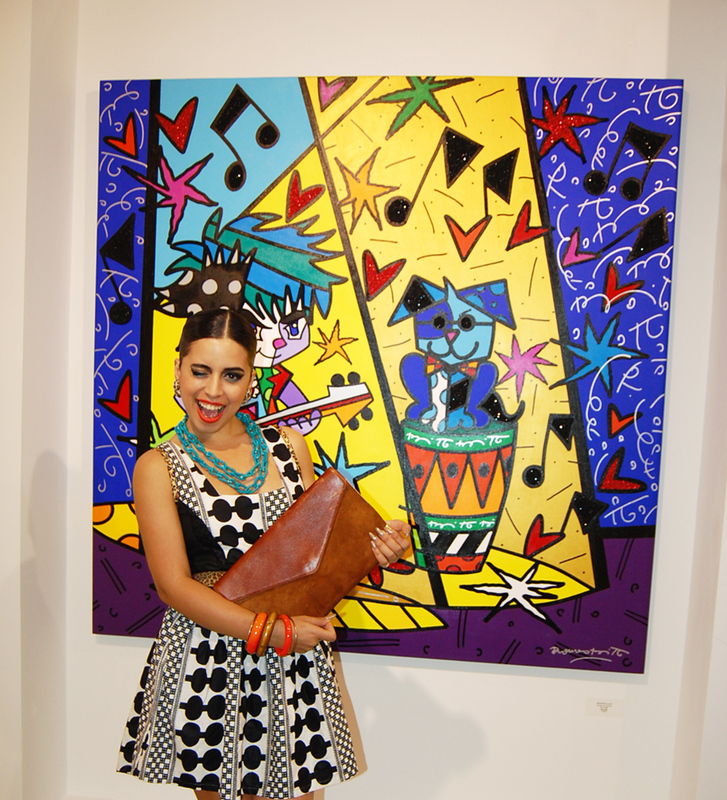 I love it because I love bold abstract patterns I can wear with my neon accessories. Boxing Kitten is one of my favorite brands for comfort, quality, and style. I mean come onnnn, this dress has pockets! Win! 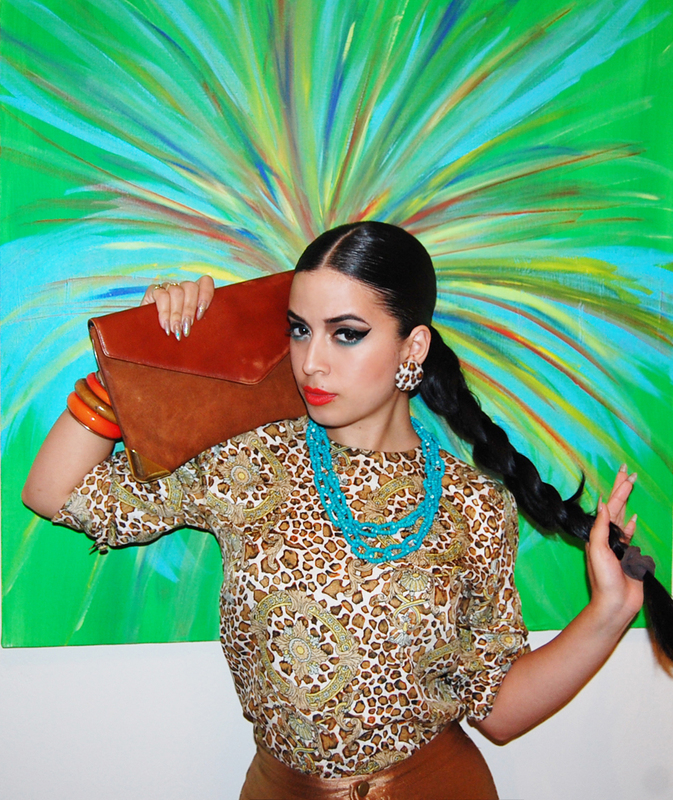 All of my accessories are from random garage sales, flea markets, and of course Billy’s Antiques. Gotta love a backless keyhole. 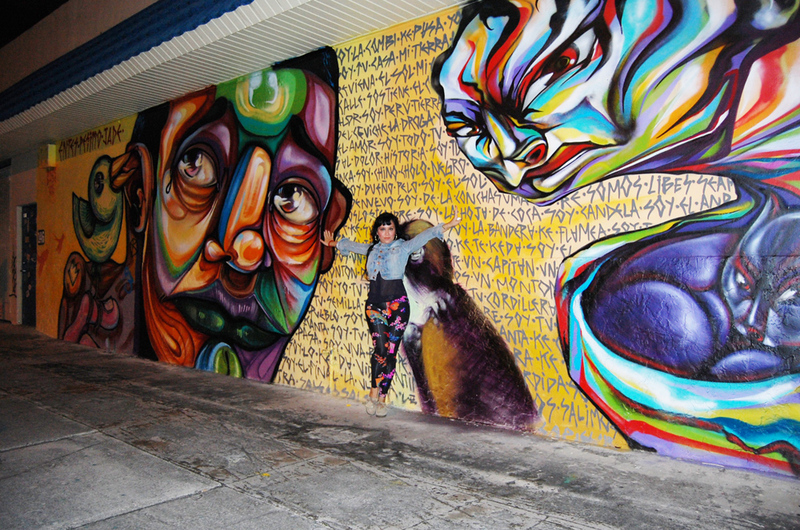 lolol Loca in front of a cool wall across from the Cope gallery. Too cool for school. 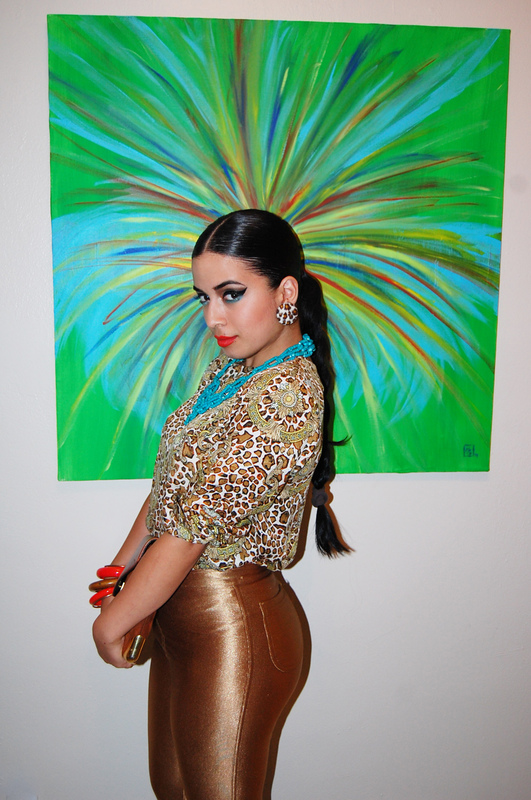 Back at the fort so I could change for the nights festivities we decided to do an impromptu fun shoot lolol. lmao Remember this top from my Salvation Army visit in Wynwood? It totally came in handy with my new gold disco pants from an american apparel warehouse sale we also stumbled across in Miami. Goldrush~ gold pants no? 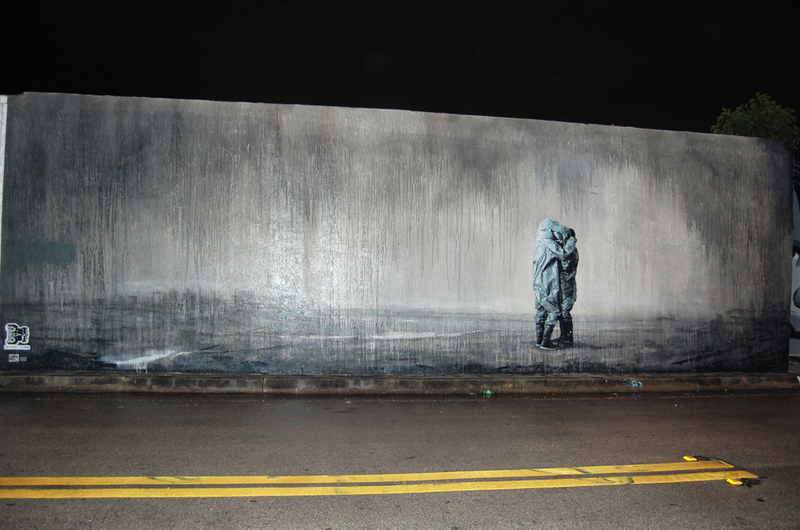 Back wandering the Wynwood streets we came across this BEAUTIFUL piece. Oh my god. So cool. Loved this portrairt of a woman on the other side. There goes my favorite lil brainy toon created by Ewok 5MH. Too f*cking cute! 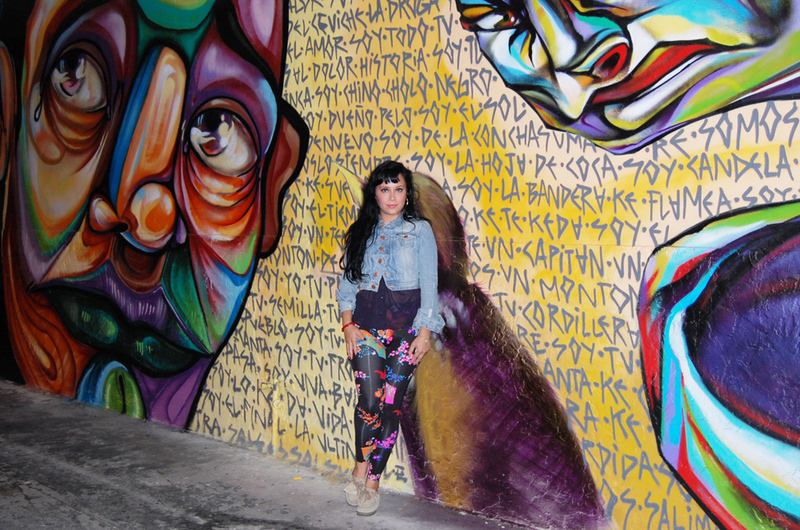 I mean…Wynwood was an art heaven. Look at Ini looking like she was blowing with the wind on the titanic lolol. I spy with my little eye…shiny pantalones. wowza. 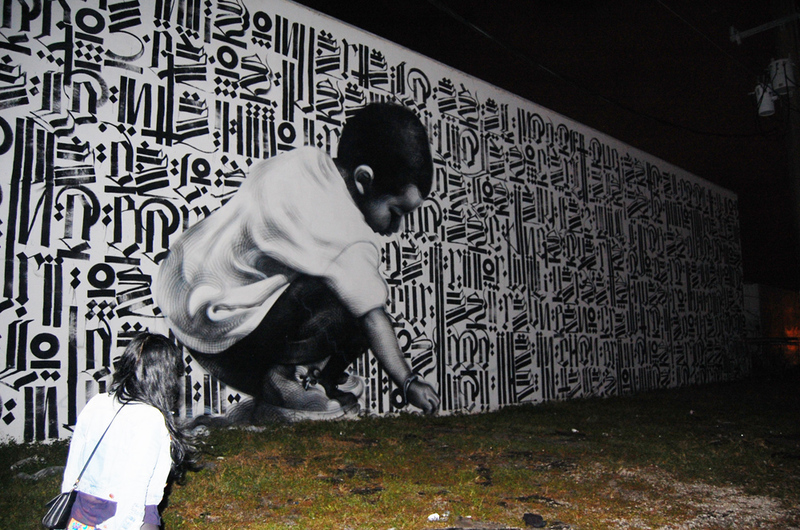 I loved all of Shiro’s characters in Wynwood too. Adorable and sassy! R.I.P Amy Winehouse. 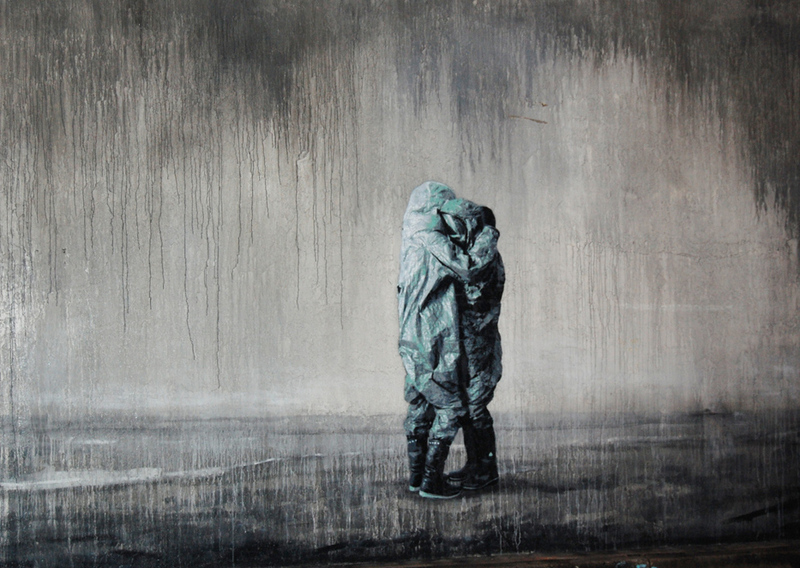 Loved this piece. I had to take a pic with the finished Buff Monster x Cope2 wall! 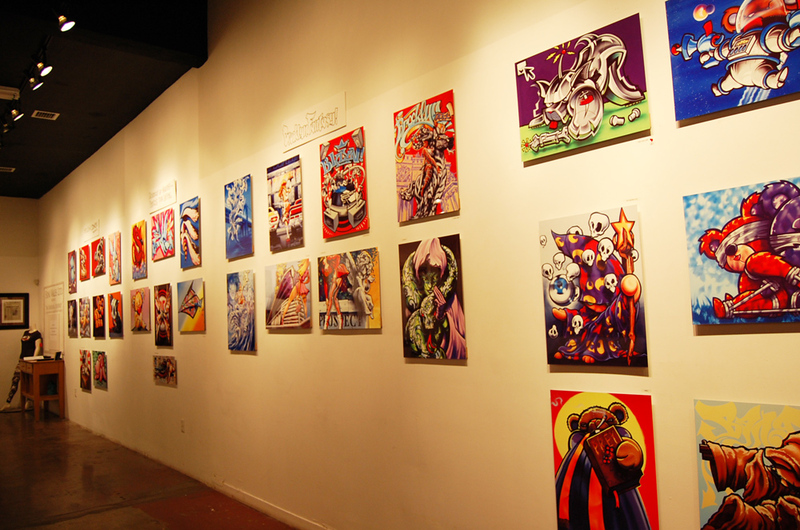 The EVL World gallery! I love his teddy bear pieces the most. these were my favorite. Fell in love with this awesome signage on our way home. Awesomeness personified. 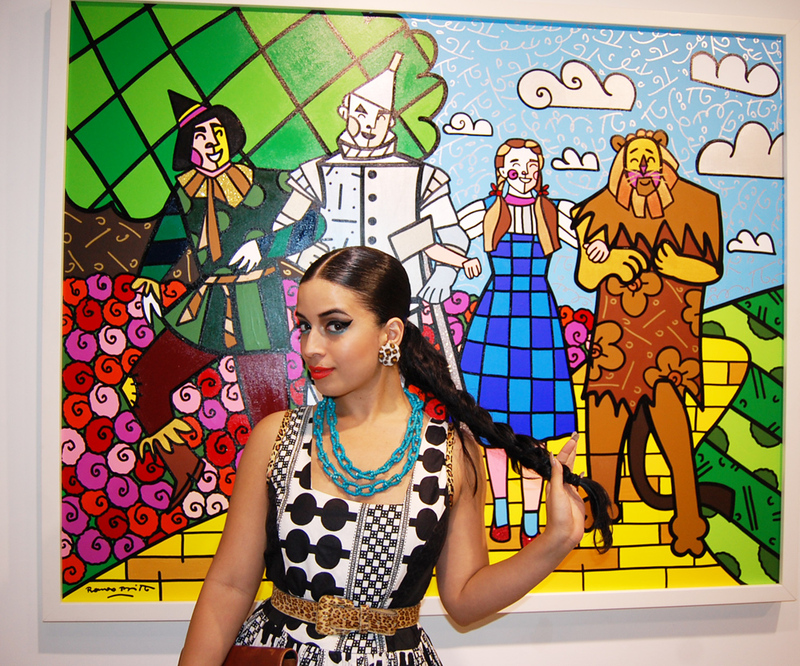 ← Art Basel with KD in Miami: Day cinco! 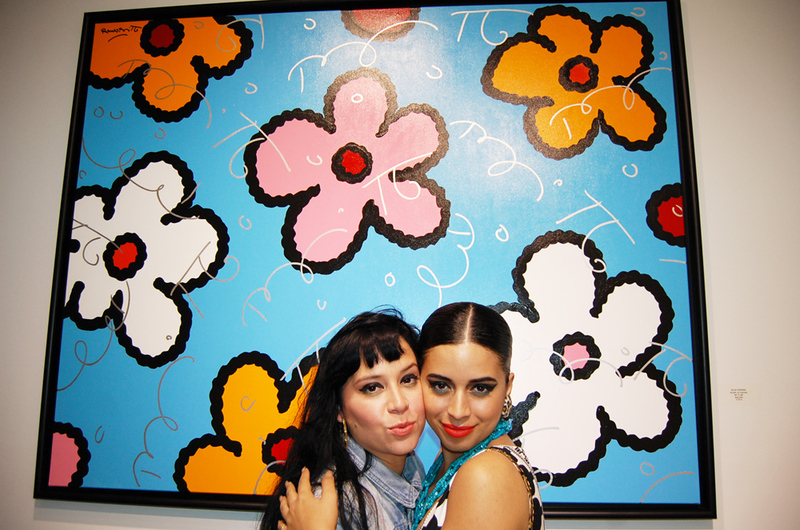 what a coincidence.. my cousin betty jus sent me a pic of that dulce canvas from the same art show… small world.. heard it was amazing! 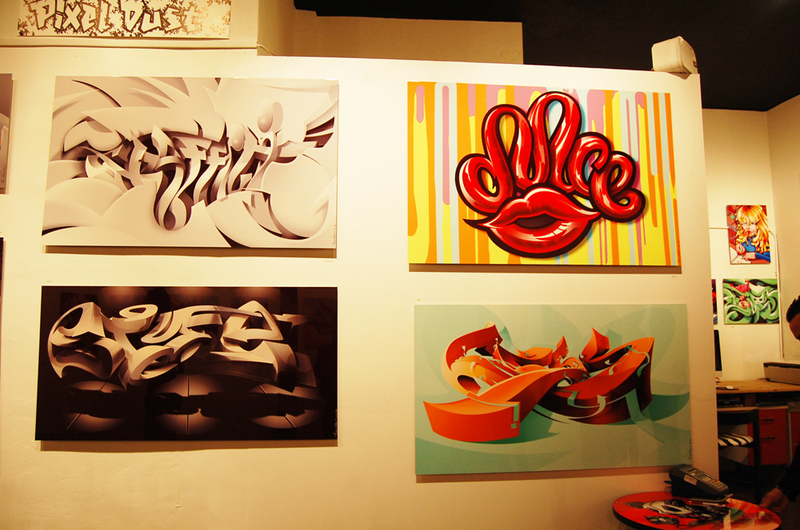 Your blog is wonderful and I like all of your images of graffiti art!! 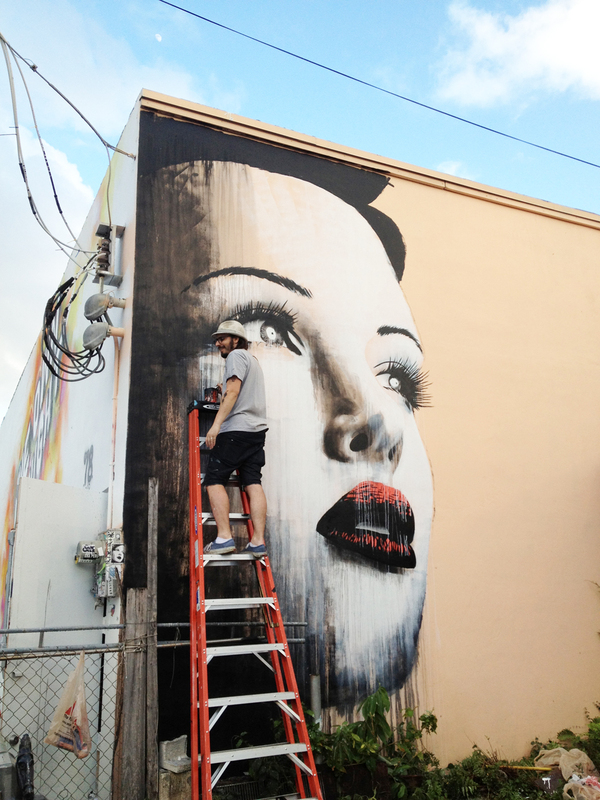 Wish I was in Miami for the art basel! I’ll come back on your blog for sure!! 1. Am pretty lax about my students and their doodling. I caught a student (2nd grade) drawing some cartoon like things in his notebook and decided to lay low on the reprimand and encourage him to keep drawing. I remind myself everyday that my students have multiple intelligences and kids can learn through art or can be artistic geniuses! 2. 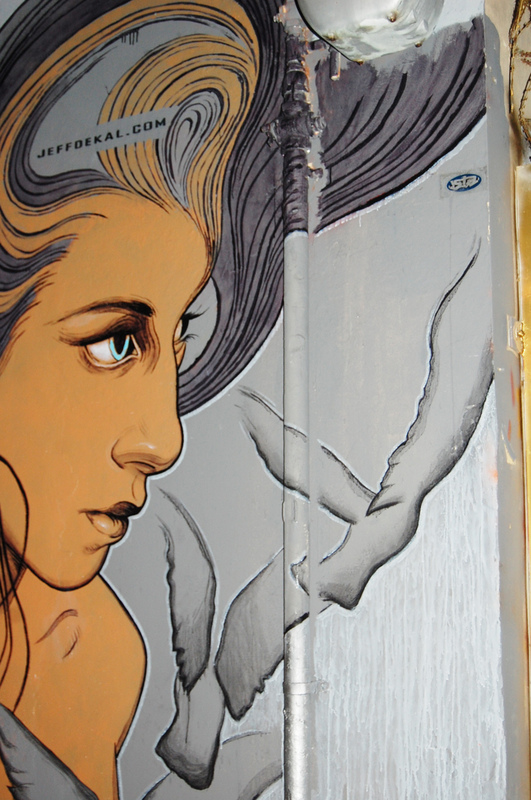 Am more aware of art, specifically graffiti, in my neighborhood or around places I visit. 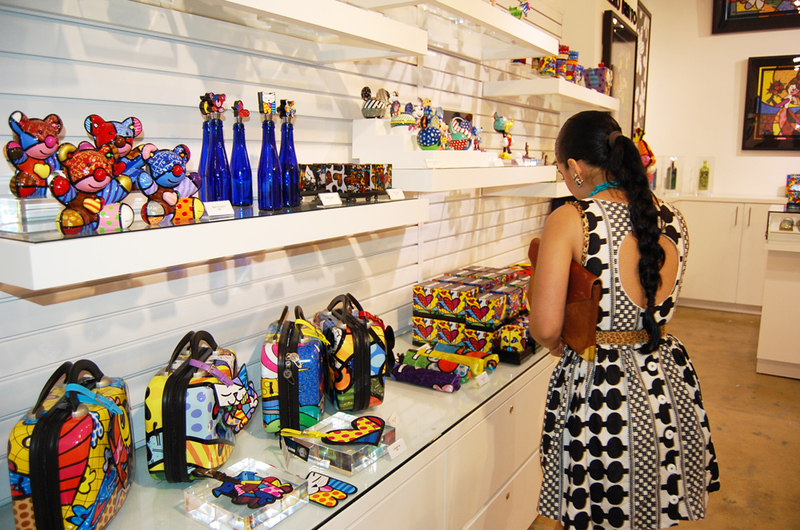 I’m in New Orleans now and while browsing some handmade items and art sold at the French Market I was attracted to Dia de Los Muertos, sugar skulls, and pop art. 🙂 I’m glad you had a great time in Miami! I enjoyed the pics! I love visiting this website, because what I need there. Oh my god! 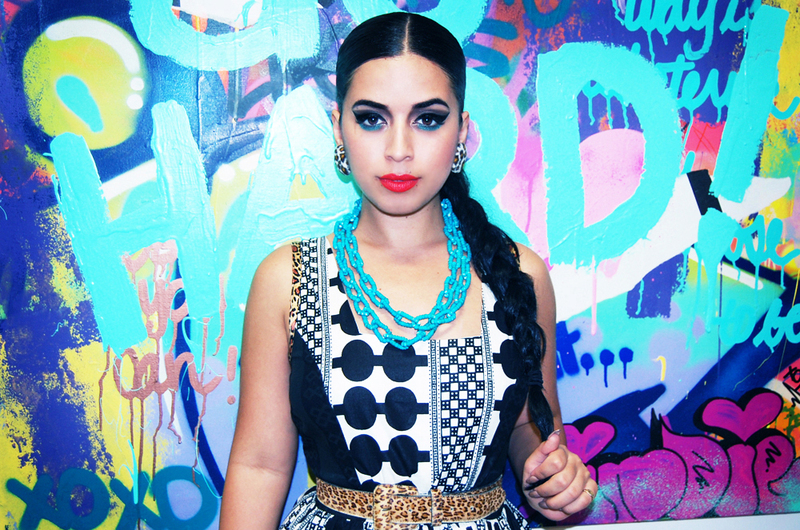 So many nice pictures:) Can you please make a video or tutorial on how you do your makeup? It’s just so gorgeous ! 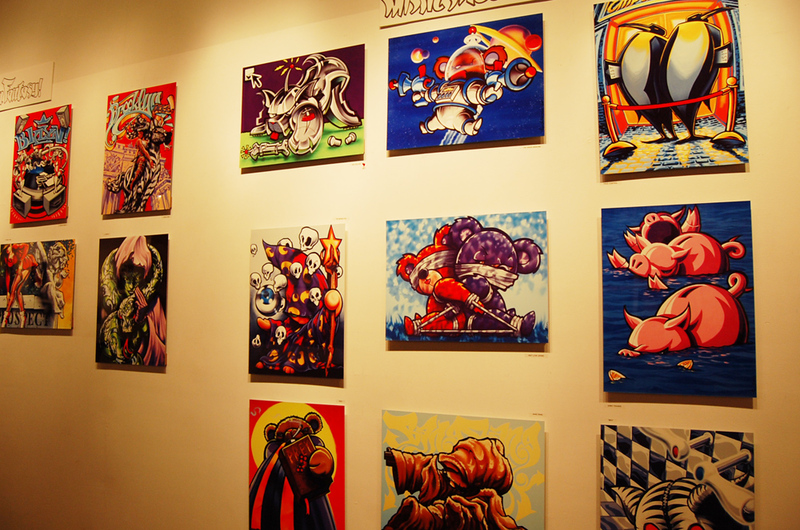 OMG you got to see so much cool in depth art. 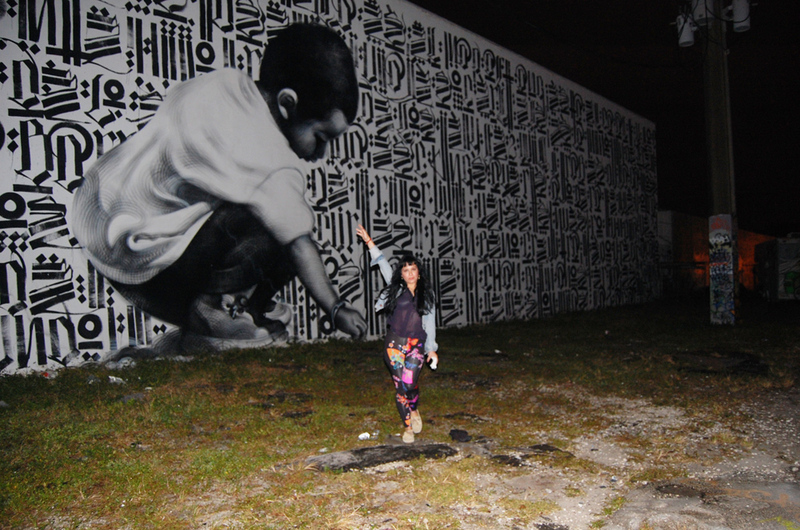 I love all those murals you found on your night walk now that is wat i call declartions of CREATIVITY at their finest!…You look fabuloso as usual love all the fun prints your splashing around! Oh and i finally get to see you in my fav designer Boxing Kitten totally green for that dress. You both look so gorgeous! I really wish I could have gotten some of those Versace leggings! They look amazing on her!